As a little girl, I think we all hoped to be a princess when we grew up. We had these fairy tales all planned out, from Cinderella to Snow White, the crowns and beautiful dresses made our hearts flutter. It didn't seem like such a fantasy as a young girl. Then as we grew, we learned that princesses don't always look so cliche. Their father may not be the King of all the land, they may not go to the ball, or even wear a crown. So what was it that made being a princess so appealing? Was it the beauty of the girl or was it the regality of her attitude? My job as a photographer is to take the way you feel and put it into a picture. This picture could be so many things. Maybe it's the love you have for your significant other, your family, or maybe it is the confidence you feel in your business. Regardless of what the image looks like, the most important part is that you see you in them. So the driving question behind all these images is, "Where did the inspiration come from?" The truth is, it didn't. It didn't hit me like a ton of bricks and scream "DO THIS!". I think with a creative mind, like hoping to be a princess as a little girl, we all wish to do things that are noticed and stand out. I built this styled shoot piece by piece and luckily, things just kept falling into place. The first thing I said when I saw this skirt was, "she looks like a princess". I ran with it. I knew that when building this shoot it was important that it wasn't cliche, I didn't want to buy her a crown or give her a $1000 dress to show off. What I wanted was to create a princess from very little. Even as an adult, we still want to walk into a room and be noticed. We still want to twirl in a skirt and have little girls swooning over our princess-like demeanor. But this shoot just proved that it isn't the price tag on the dress or the crown, but the way that we treat people, the confidence we carry within us. 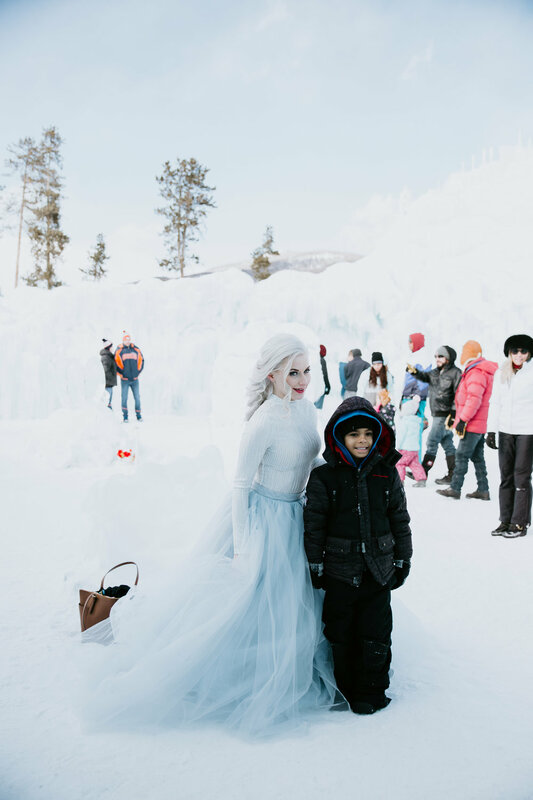 Walking into the Ice Castles with a boat load of photography gear (I always overpack), skirts, shirts, and veils.. little girls and boys are running through the castles. As soon as Savannah (the gorgeous model in these images), walks through the entrance to the castle, every child and parent stops. We just made the dream real for every little girl (and mom, sister, and aunt) who's dream is to grow up to be a princess. I could barely take the first picture before a line of children swarm us to talk to her. This is how I knew I picked the right model. It was 14 degrees, Savannah is wearing a sheer shirt and a skirt, and she has now interacted with everyone who has came to her. She took at least 3 dozen pictures with little girls, a handful with some awestruck little boys, and a few with adult passerbys who were just as interested. There were lots of whispers about who she was, which for Disney's sake I'll leave that up to you to figure out, if the castle was her home, and if she'd be making a singing debut later in the day... which we never did get to. The point of all of this is that while I am so ecstatic about creating a vision that I didn't even know I had, it was 100 times more worth it to see the happiness that it brought with us. Being a princess was no longer just a dream, but a reality.